The journey for us has begun… four women, four lives that meet to pass 20 days together towards the “unknown”. The feeling of a journey as a learning experience, that until just a few days ago we thought to be impossible, became bigger and bigger with every metro and bus change. The apartment, located on the top of a five-floor building with no elevator, like most of Lisbon buildings, is wonderful. But the most important thing is the feeling of “being home”. The destinations for our volunteering were: Albergues Nocturno and Banco Alimentar (Food Bank). Laura and I were destined for Banco Alimentar, while Rina and Anna for the Albergues Nocturno. We spend the morning with Paula, who takes us to meet the team of Banco Alimentar, one enormous complex of storehouses where the food offered by both citizens and the food industry is redistributed and redirected. We meet Isabel, the President of the Banco, Ana Vara, volunteer manager, Juan, sorting storehouse manager and Ernesto storehouse manager, a gorgeous 83-year-old, the oldest of the team, both by age and experience. He is the one that will guide us step by step. Our first goal as volunteers was: together with other volunteers (we’ll be in total ten) we have to put together 25.000 cardboards (caixas) for the upcoming solidarity campaign of the Banco scheduled for Saturday and Sunday (sabado e domingo). We work cheerfully, we don’t feel obliged to do anything and it is precisely this freedom, which makes the success of work inversely balanced, we laugh, we joke and we work really hard, 25000 cardboards really seem a lot! After two hours of work, Ernesto already gives me a nickname la maquina (the machine), I like that (me gosta). One day, Paolo (the director of Albergo Notturno, where Anna and Rina volunteer) brings us all together with his family to Setubal near the Ocean, where we discover on of the most beautiful beaches in the world and the choco frito, a famous Portuguese dish! In the next days we decide to participate in the Banco Alimentar’s National Food Collection initiative. The weather is beautiful, young volunteers from all over the world work in the rhythm of the music. 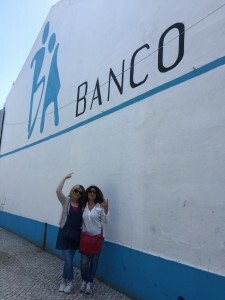 On Mondey the Banco Alimentar stays closed to let its volunteers have a rest. In the next few days, after the experience of the boxes, we are transferred to the compositions of the stands managed by the associations that benefit of the food collected by the Banco Alimentar. kilograms and litres of primary foods for non-profit associations dealing with homeless people, abandoned children and young mothers. Every pack that from the sorting bank we move to the stand of an association is a gesture of love. We have been here for ten days and have another ten days left. The last ten days fly by like the fresh and fast Lisbon wind, the thought of leaving such a free place and all these beautiful people, presses hard on our heart. Mais Cidadania involves us in all their initiatives. For example the workshops we all renamed “the hankerchief”, where through the traditional Portuguese dance of love we create a hankerchief, hypothetically devoted to our love, with drawings and poetry made up in Portuguese. Two days to our departure, we attend a dinner with all Mais Cidadania staff and volunteers. Commitment, solidarity, fun and cheerfulness go hand in hand. On the last day we do with Ana Vara, Paula and Ana Filipa the evaluation of our experience. We are happy and proud of what we did and of the people we met. Ana Vara shares our same feelings, we say we wished we could have done more and she says that she would never have expected such commitment. It is the first time in her experience when foreign volunteers, with all the difficulties that such a laborious work involves, move with self-confidence and are accepted and recognized by all “como se aqui, ali foram sempre” (“as if you have been living and working here forever”)! Posted in: Notizie Senior-Plus This entry was posted on Thursday, July 20th, 2017 at 4:01 pm You can follow any responses to this entry through the RSS 2.0 feed.